Everyone has probably gone through the trust game where one has to fall backwards into the arms of one's peers. The idea of this is to instil a sense of trust by showing that the people around you will take care of you and lift you up when you need to be supported. Although the premise of the game is good, and the reactions of participants tend to be quite strong, this particular game has become slightly clichéd. Thankfully, though, there are other trust-based games which are effective in encouraging friendship. These tend to work best with younger children, but they can occasionally also be used with older kids and teenagers. 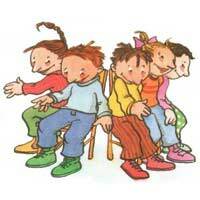 One great silly friendship building game is a version of Musical Chairs with a difference. Instead of removing a player and a chair from the game each time the music stops, only remove a chair! This eventually means that the group will end up having to squeeze onto one chair, of course. Make sure the chairs you are using are sturdy, and also try to ensure that the group is not too big as even the strongest chair will struggle under the weight of 15 overgrown teenagers! This will definitely break any lingering ice between members of the youth group as it is in their interests to help each other not to get crushed. Another silly game to play with a new group is Silent Interviews. This is very much like a game of Charades, except it involves imparting rather more information, so it can be quite hilarious to see the frantic acting of the children. Split the group up into pairs and have each pair tell each other three things about themselves - but without speaking. When they have had enough time to give it a good go, bring everyone back into the group and have each person introduce their partner, and the things they learned - or at least the things they think they learned! This game reveals interesting facts about each person and helps to build bonds between peers in a very fun, relaxed way. Games that require children to get up close and personal are fantastic ways to build friendships, or to build upon relationships that already exist. It's hard to remain a distant acquaintance with someone when you've had your elbow in their neck, or your knee embedded in their armpit! Physical games help break down boundaries, both metaphysical and otherwise, and the bonus is they're also great fun. The Human Knot is one such example of a game that requires everyone to get relaxed and silly. Six to 12 group members stand in a circle, then have to hold on to another member's hand - but not someone standing either directly to their right or left. This game requires a lot of cooperation and is a great team-building exercise. Best of all, the hilarity that ensues is unimaginable!The Obstacle Course is another fun game that challenges children both mentally and physically. Get a group of three children to make a makeshift obstacle course, using a piece of chalk drawn on cement. For example, they may draw a box that someone has to jump in five times, then a circle they have to stand in and turn around ten times. They then have to walk backwards on a thin line, stopping in a drawn square where they have to shout "Duck!" Kids will have great fun both designing the course and completing it. Never forget that a good game is a great way of building friendships between people. But also make sure that the way you lead the games is both fair and firm; the most likely way for a friendship game to go wrong is if people feel that they have been dealt with unjustly, so concentrate all your efforts on being a just referee, and you won't go far wrong. Now check out some team building games!Here's to many happy friendships as a result of your leadership. Hey nnnnn the ads usually reflect the browsing history of the person's computer you are using... sooooo.... maybe start there. i think that there isn't enough games, what if you planning a friendly games night??? I need a team building game for 5 or 6, any help? ?